So I took it to the best electrical shop in Santa Barbara. They kept working with it a month before giving up. “We’ve tried everything. It is impossible,” they announced. That evening my close friends Anita and the fine painter Yasu Eguchi were over for dinner. I showed them the lamp and told them the disappointing results. Yasu who loves great challenges asked if he could take it home and try. I said it was hopeless. The experts in town gave up on it. But the lamp went home with the Eguchis. Two days later Yasu was at the front door smiling broadly holding the lamp which sported a nice new electric cord going through it. “Yasu how did you do it?” I asked in total amazement. 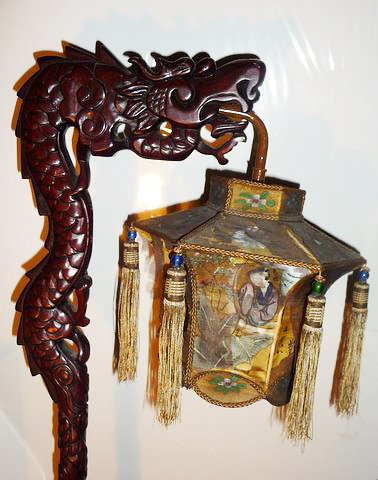 Now I have safely wired dragon lamp. And somewhere a heroic beetle is living out it’s life in healthy peace. 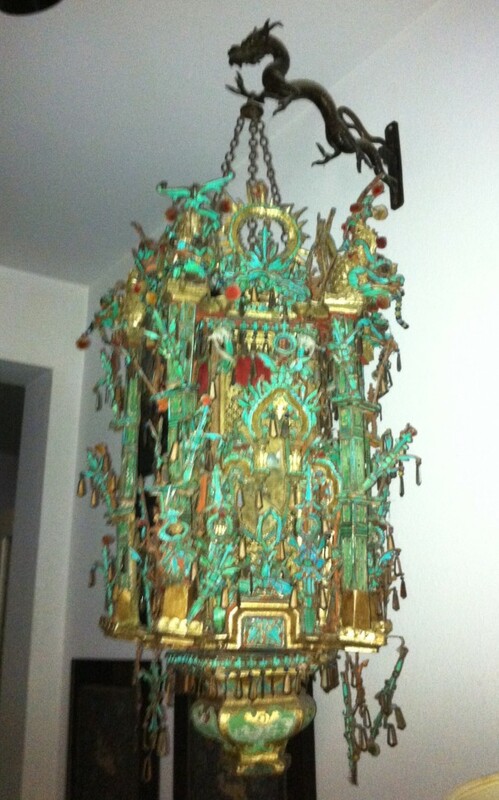 A favorite dragon holds court in the entrance to my living room holding up a very large Chinese lantern made of blue Cambodian kingfisher feathers. 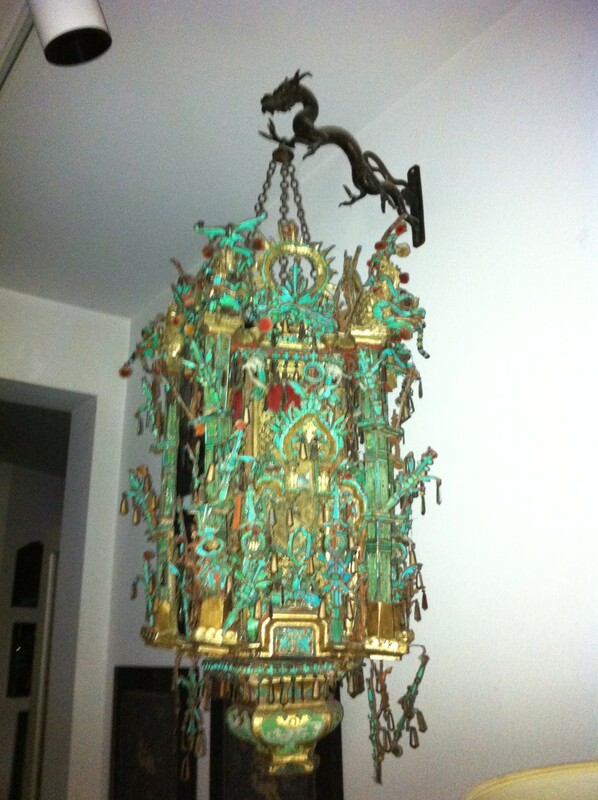 Marie and the late Bob Carty found the very special old lantern for me in a Los Angeles antique store over 30 years ago. How to hang my lantern was a problem. A temporary plant hanging “arm” from the nursery was starting to prove not so temporary when Bob called one day to say he was on the way over with a proper black cast iron dragon lantern holder. It was perfect! “Where did you ever find it?” I asked. “I was waiting in Mike’s (Mike Haskell a mutual friend who deals in rare Native American antiques) for him to get off the phone. 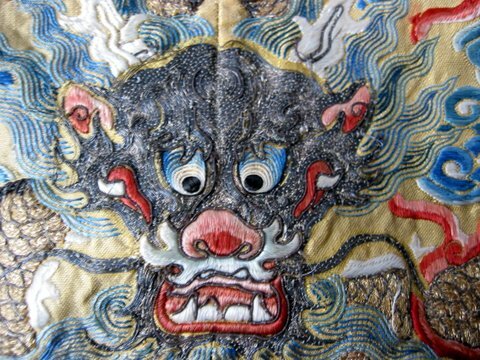 While I was waiting I was helping him unwrap a shipment of very old Navajo baskets and your Chinese dragon was nestled in one of them.”. We were never able to find the real provenance. 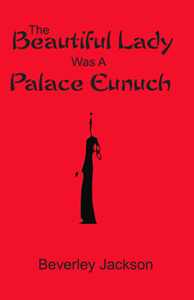 Ancient Chinese palace to Navajo reservation in New Mexico to me in Santa Barbara, California. Not a usual route for sure! 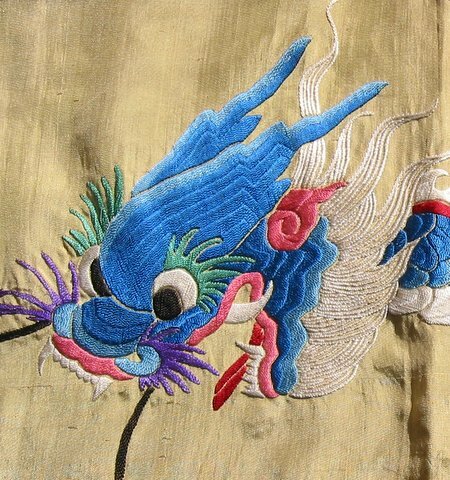 This dragon embroidered basically with silver foil covered silk thread in a technique called “couching” was one of many dragons on a very rare yellow robe of an empress from my collection. 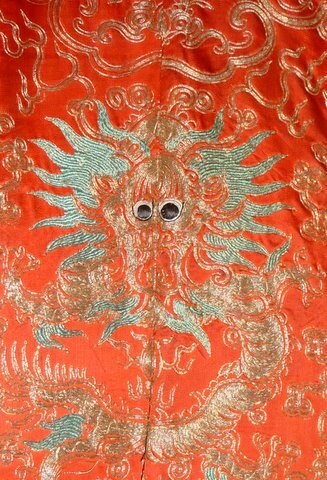 What made this robe so special was: An empress was entitled to wear five of her husband’s 12 symbols on her robes for festivals or religious ceremonies. Those symbols were sun, moon, power, good luck and a three corner constellation. This robe had a sixth symbol, a four corner constellation in addition to the three. Only six other robes with four corner constellations are known in the world. My robe is now in the collection of a Chinese collector and has been on display in the Hong Kong Museum. 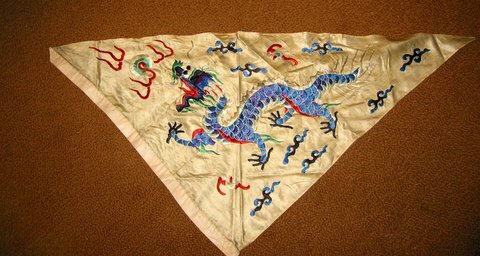 This is a dragon from a theatrical robe in my collection. We know it’s a theatrical garment because it has exaggerated eyes and also if it showed the sides would be closed by ties instead of buttons, easier for quick changes. 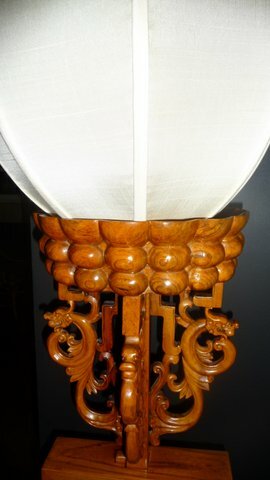 There are four rather harmless looking carved wooden dragons on the pair of standing lanterns in my dining room. 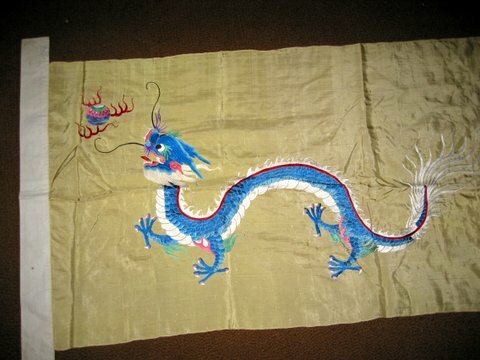 Here is the dragon's head from the satin table cloth in my dining room. 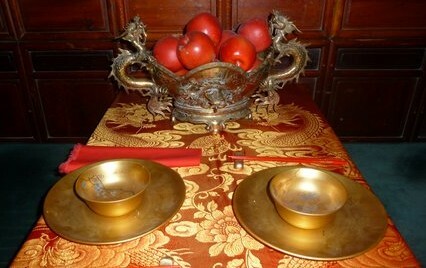 The bronze bowl holding apples on my dining room table weighs a ton! The handles are frightening dragons with very sharp scales. 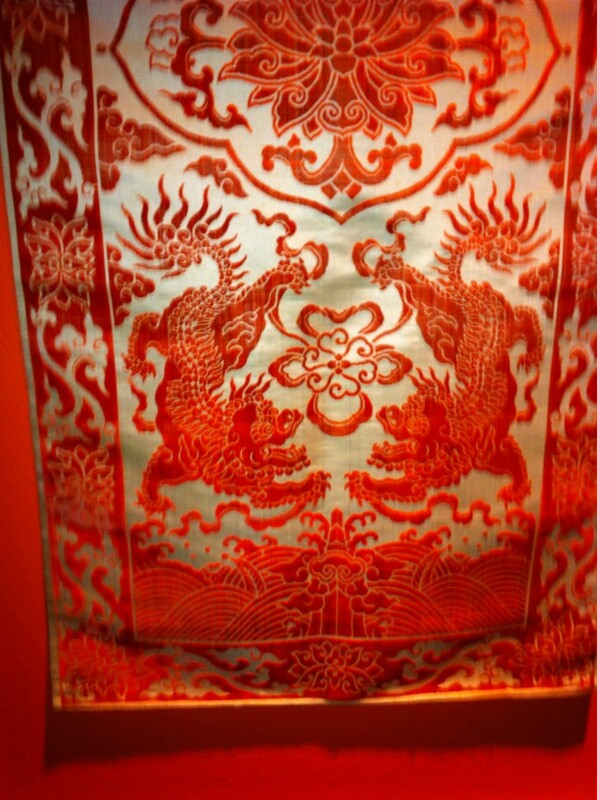 The table cloth it sits on has two dragons whose heads are more or less hidden by the bowl. 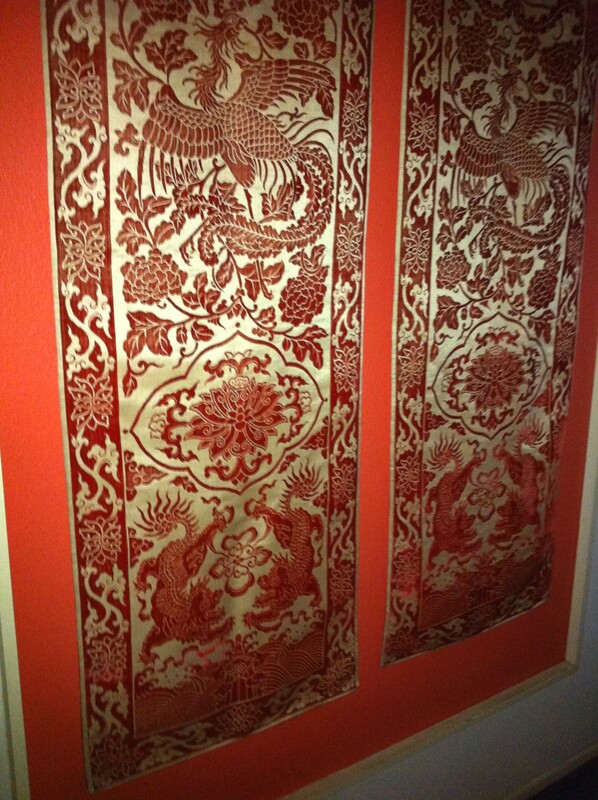 The four dragons seen here are playing around on a lovely pair of 1920’s Chinese cut velvet chair covers. These chair covers found popularity in early 20th century movie star mansions in Hollywood where every Steinway piano was draped with a heavily fringed “Spanish” shawl which were all made in China. Think Norma Desmond/Gloria Swanson’s home in “Sunset Boulevard”! Since they hang in a narrow hallway it is difficult to photograph full length. But here you can see the very grand Phoenix bird they frolic with. And adding to delight with these dragons they are coral color, a great favorite of mine. 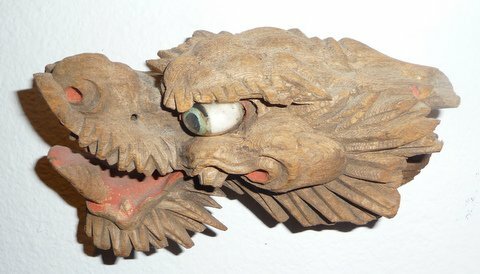 This is a carved wood fragment, probably late 18th century of the head of a dragon. The inserted eye is a very fine example of Peking glass done in several colors. Some of early red paint remains in the mouth and nostril area. 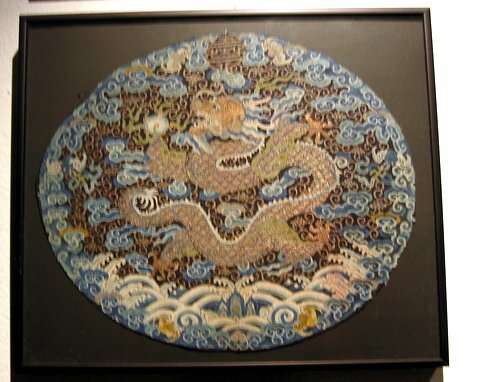 It most likely was originally attached to a long carved dragon. And just for fun. 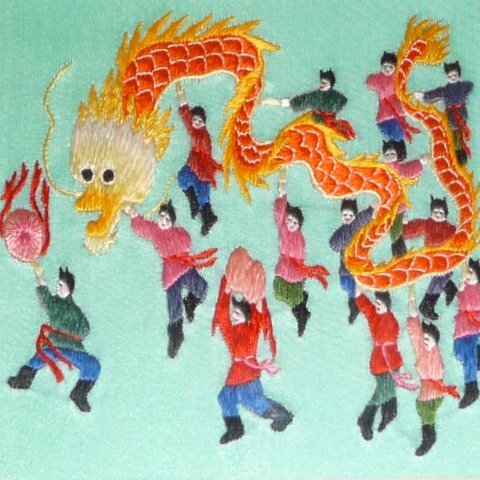 A video from the 2011 Chinese New Year’s Parade in San Francisco. 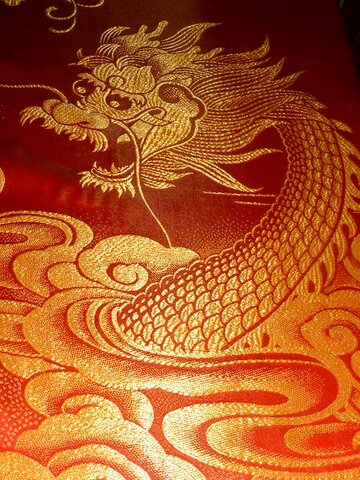 I learn so much from you…and I love Dragons and Phoenixs. Wonder if you (and I!) being Scorpios inclines us to such ? Oh how wonderful + I, like Barton, learn sooo much from you…! Thank you Barton & Peggy. Am gathering people are really into dragons! I’m overwhelmed tiday with emails about this post from all over the world! I could be a tough opponent in 2012. Lucky I’m not running for office! That lantern is pretty special. Think we could do a necklace out of that? I wore my lotus shoe necklace for photographs that came out in the Santa Barbara News-Press today. It showed up beautifully. They had two full pages of an article on my robe collection and pictures of me, wearing your fabulous lotus shoe necklace, inside my Chinese wedding bed dining room and pictures of some of my robes. I’ll mail you a copy. Love your Chinese lantern made of blue Cambodian kingfisher feathers! If you thinking to sell it let me know.